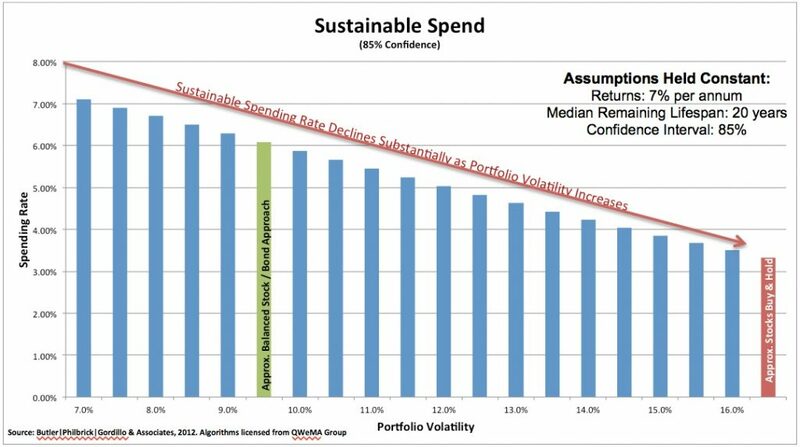 In a prior post entitled ‘Retirement’s Volatility Bogeyman‘ we introduced the critical concept that volatility is the unsung villain of retirement sustainability. This article will reiterate the concepts we presented in the prior article, and demonstrate how an investor can tolerate lower returns so long as volatility is actively managed in the context of a more traditional balanced portfolio. Safe Withdrawal Rate (SWR): the percent of your retirement portfolio that you can safely withdraw each year for income, assuming the income is adjusted upward each year to account for inflation. 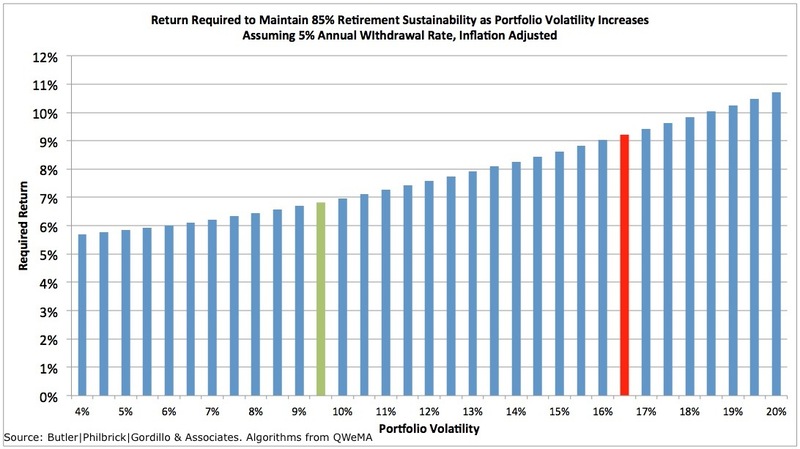 Retirement Sustainability Quotient (RSQ): the probability that your retirement portfolio will sustain you through death given certain assumptions about lifespan, inflation, returns, volatility and income withdrawal rate. You should target an RSQ of 85%, which means you are 85% confident that your plan will sustain you through retirement. All portfolios deliver 7% average returns. Future inflation will be 2.5%. Median remaining lifespan is 20 years (about right for a 65 year old woman). We want to target an 85% Retirement Sustainability Quotient (RSQ). Note how SWR declines as portfolio volatility rises. The green bar marks the volatility of a 50/50 stock/U.S. 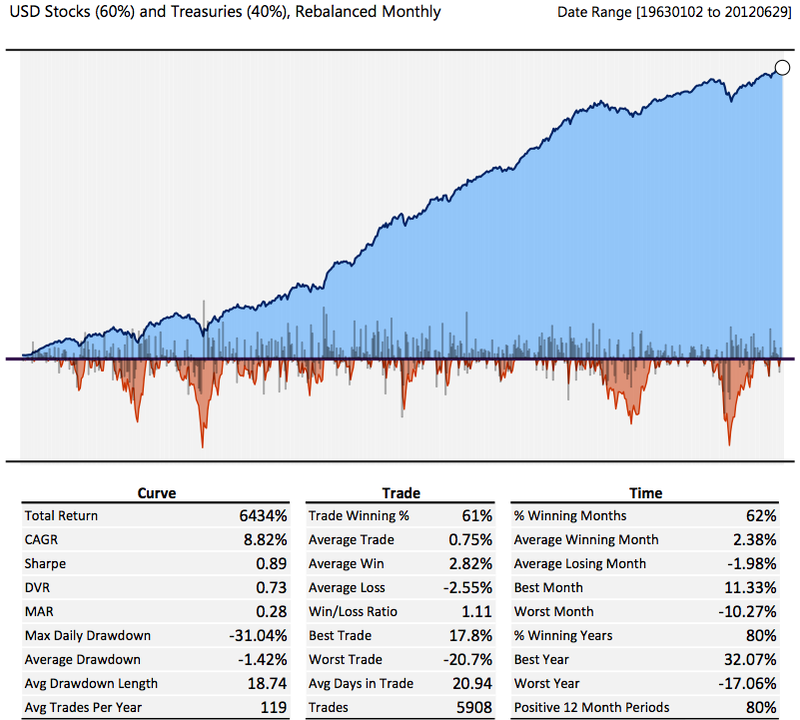 Treasury balanced portfolio over the long-term, while the red bar marks the long-term volatility of a diversified stock index. Note the SWR of the stock/bond portfolio is 6% versus 3.4% for the stock portfolio, highlighting the steep tax that volatility levies on retirement income. This is actually quite intuitive when you think about it. Imagine a scenario where two retired persons, Steady Eddy and Risky Ricky by name, draw the same average annual income of $100,000 from their respective retirement portfolios. Both draw an income that is a percentage of the assets in their retirement portfolio at the end of the prior year. Steady Eddy’s portfolio is invested in a balanced strategy with a volatility of 9.5%, while Risky Ricky is entirely in stocks with a volatility of 16.5%. Both portfolios earn the same return (as they have done for the past 15, 20 and 25 years, though we will address this in greater detail below). Due to the lower volatility of Steady Eddy’s portfolio, his income is less volatile: 95% of the time his income is between $82,000 and $117,000. In contrast, Risky Ricky’s portfolio swings wildly from year to year, and therefore so does his income: 95% of the time his income is between $67,000 and $133,000. Of course, both of their incomes average out to the same $100,000 per year over time. All other things equal, which person would you expect to be more conservative in the amount of income they spend each year? Obviously, if your income were subject to a large amount of variability each year then you would tend to be more conservative in your spending; perhaps you would squirrel away some income each year in case next year’s income comes in on the low end of the range. This relates directly to the impact of volatility on SWRs in the chart above. Volatility introduces uncertainty which is amplified by the fact that money is being extracted from the portfolio each and every year regardless of portfolio growth or losses. How Much Gain Will Neutralize the Pain? Of course, this effect can be moderated by increasing average portfolio returns, which would then increase average available income. The question becomes, how much extra return is required to justify higher levels of portfolio volatility? Withdrawal rate is 5% of portfolio value, adjusted each year for inflation. Retirement Sustainability Quotient target is 85%. Median remaining lifespan is 20 years. Again, the green bar represents the balanced stock/Treasury bond portfolio discussed above, and the red bar represents an all-stock portfolio. 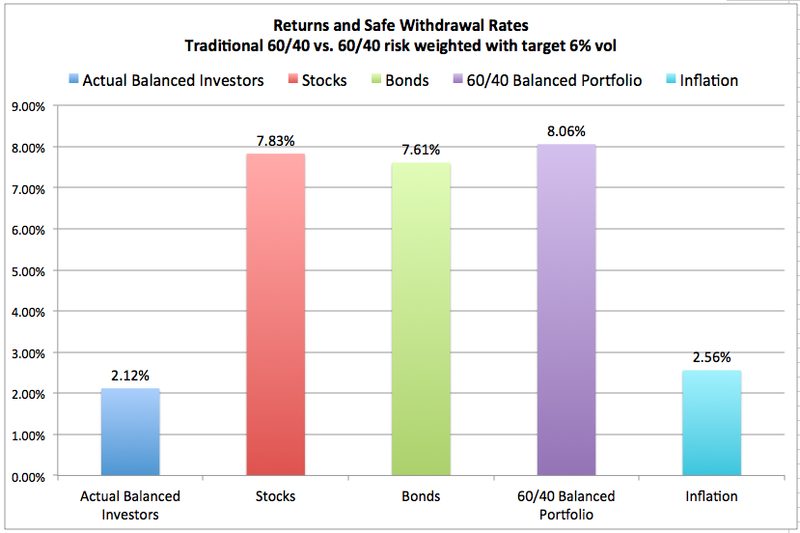 From the chart, you can see that the balanced portfolio needs to deliver 6.8% returns to achieve an 85% RSQ with a 5% withdrawal rate. The higher volatility stock portfolio, on the other hand, requires a 9.2% returns to achieve the same outcomes. In theory, higher returns in your retirement portfolio should equate to higher sustainable retirement income. In reality, higher returns at the expense of higher volatility actually reduces your retirement sustainability. It is impossible to control the intermediate- to long-term returns to asset classes, but we can control the assets we hold in portfolios, and the allocation between them. To a large extent, we can also control the volatility of our portfolio, if not total portfolio risk. First, let’s focus on a typical 60/40 stock/bond portfolio, which is the template for many retirement accounts. Not incidentally, this is also the flagship allocation for most small and medium sized foundations and endowments. For our study, we focus on returns to Treasuries rather than corporate bonds because we couldn’t find good daily data for corporate bonds, and because Treasuries alone provide true diversification against financial shocks, which means they perform as bonds should when it really counts. The simple 60/40 portfolio exhibited pretty good performance over the almost 50 year period from 1963, delivering 8.82% annualized returns with a volatility of 9.91%. Unfortunately, the strategy lost 31% of its value in 1973/1974, and 26% in 2008/2009, which would have been very difficult to stomach. 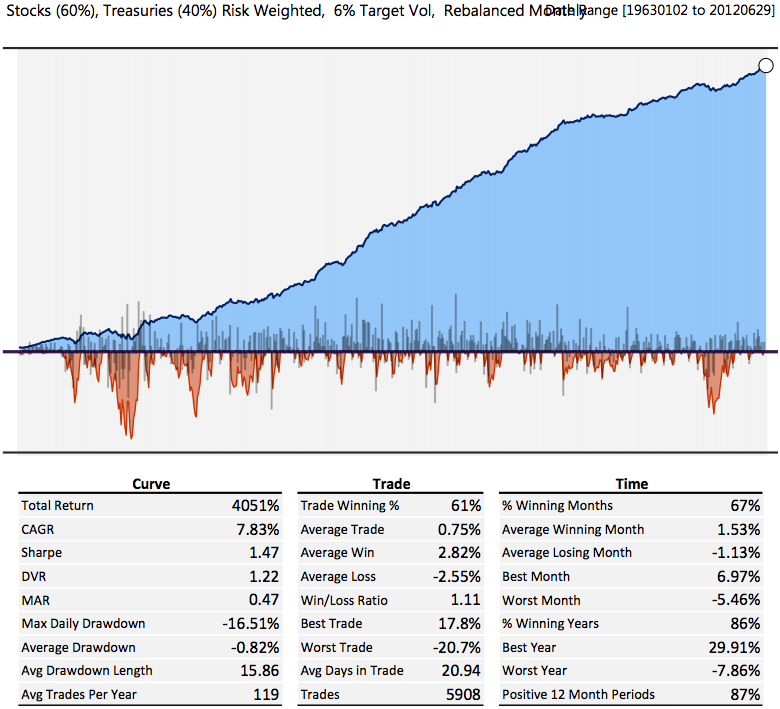 Next, we investigated a 60/40 strategy with two simple twists: we applied a 60/40 risk weighting instead of the typical capital weighting, and we applied a target volatility of 6% at the portfolio level to maintain a stable risk experience. We observe a drop in returns from 8.8% per year to 7.8%, which is not insignificant. However, the risk character changes much more dramatically. Ex-post observed volatility drops from 9.91% to 5.33%, a reduction of 46%, and drawdowns are also much more muted, dropping by almost 50% from over 30% to 16.5%. Let’s examine the impact of this simple risk management overlay on the Safe Withdrawal Rate that each strategy will support. 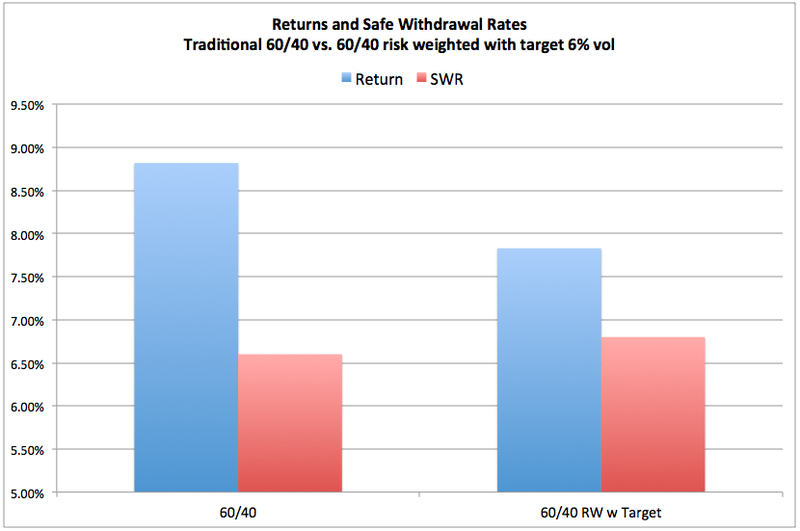 Astute observers will notice that despite the higher average returns to the traditional 60/40 portfolio, the risk managed portfolio will support a higher SWR: 6.8% vs. 6.6%. This offers an excellent example of the impact of volatility on the SWR. An investor can tolerate lower returns so long as volatility is actively managed. Further, from a behavioural and experiential standpoint, the risk managed portfolio provides a much more stable experience that investors are more likely to stick with. This last point is absolutely critical, as the chart below from Dalbar shows that the inability of traditional balanced investors to stick with their strategy over the long-term caused these investors to trail a 60/40 balanced index strategy by 5.94% per year over the 20 years through the end of 2011.